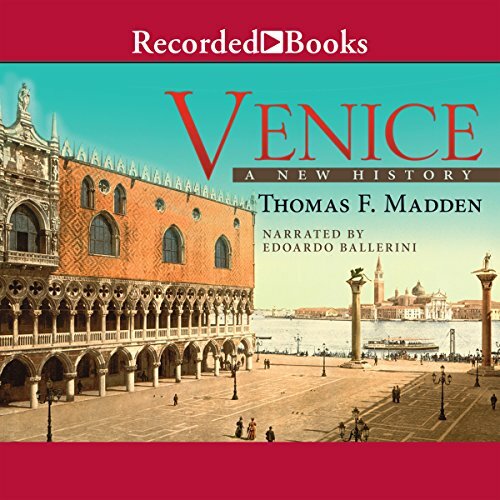 An extraordinary chronicle of Venice, its people, and its grandeur Thomas Madden’s majestic, sprawling history of Venice is the first full portrait of the city in English in almost thirty years. Using long-buried archival material and a wealth of newly translated documents, Madden weaves a spellbinding story of a place and its people, tracing an arc from the city’s humble origins as a lagoon refuge to its apex as a vast maritime empire and Renaissance epicenter to its rebirth as a modern tourist hub. Madden explores all aspects of Venice’s breathtaking achievements: the construction of its unparalleled navy, its role as an economic powerhouse and birthplace of capitalism, its popularization of opera, the stunning architecture of its watery environs, and more. He sets these in the context of the rise and fall of the Byzantine Empire, the endless waves of Crusades to the Holy Land, and the awesome power of Turkish sultans. And perhaps most critically, Madden corrects the stereotype of Shakespeare’s money-lending Shylock that has distorted the Venetian character, uncovering instead a much more complex and fascinating story, peopled by men and women whose ingenuity and deep faith profoundly altered the course of civilization. The author provides a very holistic view of Venice, covering everything from its artwork and architecture to its politics and history. It offers a great balance between narrative and scholarly detail. A must-read for any student of history. The performance is also well done, with the speaker clearly knowledgeable on Italian. What made the experience of listening to Venice the most enjoyable? Edoardo Ballerini speaks slowly and with perfect emphasis for telling what could be a boring history lesson. He brings it all to life, adding in perfect Italian pronunciation. I have thoroughly enjoyed listening to this history lesson! I listened to this shortly after returning from my first visit to Venice. It's a dramatic story, with vivid and memorable personalities. The writing is clear and elegant and overall fun to listen to. The people and the city come alive in all their colorful dimensions. I love Venice and it's history but even if I wasn't an admirer of the city this book would probably make me one. I love the narrative, at points, it keeps you at the edge of your seat as if it were a fiction novel. The narrator is also very engaging and has an appealing voice. The author did a great job of telling the facts of history but not without sharing the popular and legendary history of the city. I bought a few other history books and this is without a doubt my favorite one yet. Riveting history. Very easy to absorb and great pace of narrative. Just enough detail to provide insight without overwhelming the listener. A great achievement to cover everything from the founding of the city to the great flood of 1966. I knew little of the events leading up to the end of the republic and the eventual incorporation into Italy in the 1860s. But the tales of naval battles, Byzantine intrigue and the pilfering of St Mark’s remains are spellbindingly well told. It touches on art, architecture and music, as well as crusades and commerce. All in all, excellent. This was a detailed history of Venice, once an empire that ruled the seas, now better known as a tourist destination. At first I struggled with all the names, places, and dates, but finally I found my rhythm for listening to this fascinating history. Since this is the first history of Venice I've read, I can't say it skipped anything, but sometimes it felt as though an event important to me was too lightly covered. Then I remembered the scope of the book and realized what I thought was glossed over, was actually a drop in the bucket to the entire story. The rise and eventual fall of one of the first non-monarchy based governments was fascinating. Venice had elections of a Doge who while the head of state, also had a governing body below him. While this was never perfect, it worked for a vey long time until forced out of existence by Napoleon. Lest you think this is all about government, the book includes the wars upon Venice as well as those wars Venetians fought elsewhere. Much is discussed about the populating of these islands, the labors of the people, as well as the reasons Venice is more Eastern than Western in architecture and learning. Also addressed in this book is any scientific and artistic development, their shipbuilding and trade at sea, bookbinding and, surprising to me, Venice's role in the development of Banking. Many of the words and practices we still use today in finance began in Venice. Banks, bankers, lending, commerce, money exchanges, currency, record keeping were all products of these islands. Even Double-entry Bookkeeping and our use Arabic numerals are a product of Venice. The final struggles for Venice's survival and today's issues as a tourist destination were told in fascinating detail. Now that I know so much more, my desire to return and locate sites from the book are stronger than ever. I do not know if the book has pictures or maps, so I cannot comment on this, only that I needed them and when listening at home, looked things up. The narrator was incredible with voice as well as with pronunciation of words, names and places, no matter the language. I recommend this highly. The author does a masterful job of telling the story of Venice and its people. Considering the over 1000 year history of that city, events are sometimes and necessarily given short consideration. However, by the end, the reader has an understanding of how a band of refugees from mainland Italy turned marshy lagoon into one of the West's great powers. I was pleasantly surprised by the length of this book. I think it achieves its goal of combining better attention to facts/accuracy (as opposed to legend) with a more interesting style of writing than, say, a history textbook. In an effort to dispute the legends/stereotypes of Venetians being misers and tricksters, the book attempts to show their side of the story. I tend to think that yes, it is very unlikely that all venetians were greed motivated and sneaky. But I also think that it's just as unlikely that the Venetians were never ever ever at fault for anything that happened to them over a period of many centuries. I think that the author favors the Venetians so strongly that it makes them out to be the victims of everything when in reality, it's probable that sometimes they deserved their fate, and sometimes they didn't -- like most humans on this planet. Aside from the occasional melodrama, I found this book very interesting and informative and definitely worth reading. I would, however, recommend the BOOK over the audiobook as this particular performance is odd. I don't mind the reader's voice or portrayal, but there are lots of weird... burps, gurgles, and other strange vocal noises that happen a lot within the book. This is unbearably annoying when listening through headphones and it makes me want to turn it off and just buy the actual book. So: Story is great. Performance is meh. I read this before going to Venice for a week, and I'm very glad that I did. Venice is spectacular, and I hope to go back again, and this book helped me explain the significance of many of the beautiful buildings you'll see. This history starts around 400 AD and goes to the present time, so you'll get a true appreciation of why in the world someone would build a city with so many canals. It also helps explain why Venice was perhaps the most powerful European city from an economic perspective for many centuries; there was no way to be agricultural, and survival meant expertise in commerce. If you at all like history, and you're planning to go, reading / listening to this book should be part of your trip preparation. The book is very good. I’ve been really into podcasts but I was struggling to find something long and comprehensive outside of Dan Carlin. So this was my first try at a history audiobook and I do not regret it. Very fascinating summary of major events throughout Venetian history. Narrator was also very good at keeping my attention. One of my biggest pet peeves is when a narrator reads a quote from someone of a different nationality and they try to imitate the accent. Thank god this wasn’t done here except when words or phrases were Venetian. Would highly recommend this to any amateur history nerd that enjoys podcasts.